The Flowering Apple Tree, probably done in the spring of 1912, was shown in October and November of that year at the second exhibition of the Moderne Kunstkring in Amsterdam, together with the Still Life with Gingerpot II. The two paintings represent the same phase in Mondrian's development. Like the second version of the still life, the Flowering Apple Tree painting has discarded the descriptive function of the pictorial language and been transmuted entirely into the poetic forms of "visual rhyme" and "optical alliteration." The forms of the tree have lost all thing - value and are transposed into rhythmic accents in the composition as a whole. This picture manifests, even more distinctly and convincingly than the second version of the still life, the characteristics of a cubist composition. Color has been reduced to the benefit of form, and the individual forms combine into a compositional totality that is obviously centripetal. In other words, the painting is scarcely colored at all; the painter's palette is limited to a few tints of green, ocher, gray, and purple. During the same period, the color scale of the Paris cubists was reduced to a few shades of ocher, gray, and brown. As for the form, the painting is clearly concentrated on the foci of an ellipse, as is so typical for cubist paintings, with the aim of presenting the work of art not as an excerpt from nature but as an autonomous segment of reality created by the artist in conformity with laws of its own and unrestricted by surrounding actuality. Thus, in these paintings the four corners are left almost empty, since the entire power of the work is gathered together toward the center. An oval obviously encompasses such compositions more adequately than a rectangle, and this fact plays a recurring role in the course of the development. As compared with the only slightly earlier Gray Tree, the Flowering Apple Tree is far less painterly in surface treatment. In the earlier work, telling strokes and accents defined the form; here a thinly applied layer of paint is the means by which the structure of the whole is brought out. 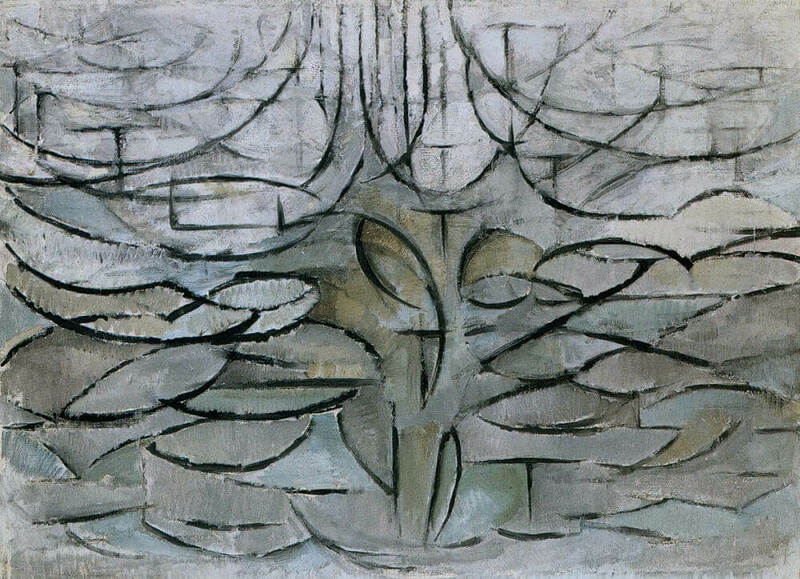 Despite the tendency of the painting toward abstraction - the paring down of form to essentials and then using this bare form compositionally - it possesses the tender lyric delicacy always associated with a flowering apple tree. For that reason we should not forget that Mondrian at this period, although strongly inclined to abstraction, continued to work from an impression of nature, translating it into his rigorous but still figurative language.